Horses are among the few animals that are defined by beauty, power and strength. They exude elegance and grace. As a literary figure, a horse is depicted as an embodiment of what is grand and majestic. Horses are known to be a loyal companion; they will go into great lengths helping a trusted comrade without questions and complaint. They are wild by nature, but once they are tamed, they are blind followers to their trusted mate. They can be bad if they want to be but will have no problem offering allegiance to a worthy ally. They are called a beast; yet their beauty can be breath taking. Horse oil paintings are likely to have the same effect with that of a live horse. It can have a contrasting characteristic of being beastly and beautiful. It can be graceful yet ferocious at the same time. No matter how a horse oil painting is illustrated, it can surely create a sense of dynamism to any area you decide to place it. 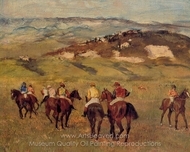 There are many ways horse oil paintings are epitomized. Very popular pieces are those wherein you will see seven majestic horses, in different colors and sizes, galloping playfully on the water. This kind of horse oil painting has been treated differently by artists. You can find the same subject used over and over again on different canvass sizes and different mediums. 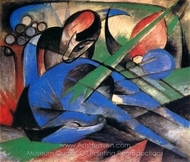 What exemplifies this particular horse painting is its vibrancy. It shows movement and vigour. It radiates strength of seven very robust beasts; yet, the frisky spirit as they gallop spiritedly on water, elucidates youthfulness and frailty. This is a very contrasting artwork that gathered a lot of appreciation from many art enthusiasts. It is definitely one of the most powerful illustrations made for horse oil paintings. 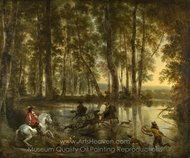 Horse oil paintings are best placed on areas where there are a lot of activities going on. A reception area or a living room is among the best place where you can put a horse painting. Big paintings can really create a message of power. In a business area, a painting of a horse can convey strength and vitality. It can send an impression of corporate supremacy and dynamism. 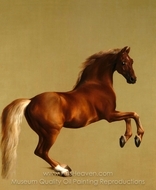 In a living area of the house, a good horse oil painting can elucidate refinement and splendour. Only a good-looking beast like a horse can create an impression as powerful as those. 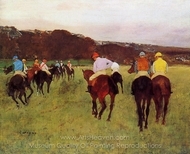 You can find many beautifully painted masterpieces with horses as the subject. Normally, these pieces use colors rich in brown, black, gray and white hues. 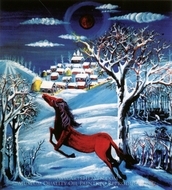 Majority of horse paintings tends to be dark at times that can be perceived to be mysterious. 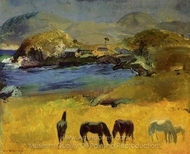 If you prefer brightly colored paintings, look for pieces that have backgrounds of green meadows or wide-open sea. 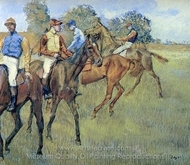 There are also selections of horse paintings that illustrate a more feminine appeal. These pieces have horses that have a pinkish blush in a less structured poses. 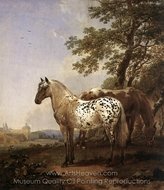 These types of horse paintings will look great on bedrooms and resting areas of the house.